Parenting can be FUN and REWARDING…and it is the most important job you will ever do. Your child was born to learn, and as a parent, you are your child’s first and most influential teacher. 90% of the brain’s growth occurs between birth and age 5. You help shape your child’s future through the kind of experiences you provide. The Parenting Cottage utilizes Parents as Teachers (PAT) evidence based curriculum and certified educator coaches to provide a FUN parent and child educational journey as well as a family support program. The program serves families from onset of pregnancy to kindergarten entry. Services are provided at no cost to participating families. Services available to families that reside in Lubbock County. 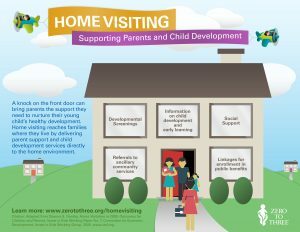 Biweekly Personal Visits—where you will receive age-appropriate child development information and participate in parent-child activities designed to help you and your child learn. Parent/Child Group Meetings—where you will have opportunities to share information about parenting issues and child development, while learning and supporting each other. Screenings—certified educators conduct assessments of your child’s overall development in language, thinking, social, emotional, and motor skills as well as basic health, hearing and vision. Resource Networking—provides your family with referrals to other community resources. School Readiness-enhances social skills, language skills, cognitive abilities and literacy skills. If you would like to be referred to our services, click here to fill out a referral form that can be mailed or faxed.